Good funky news. 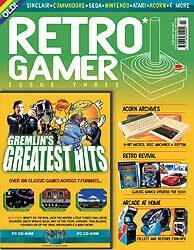 Retro gamer magazine in the UK is now coming every 6 weeks, it has really took off! Did PeeknPoke not tell you Retro was in? :) It seems to have found a place in the market and this new issue has a cover mount disk that contains The Gremlin collection. Cor! Is it a complete collection of Gremlin Graphics software we wonder? Looks like it. All this and loads more features (Arcade at home looks good to me). Get it on April 15th in the UK from your local news stand.